Many people know that garlic, as a seasoning, is indispensable, because it has a great original taste and aroma. 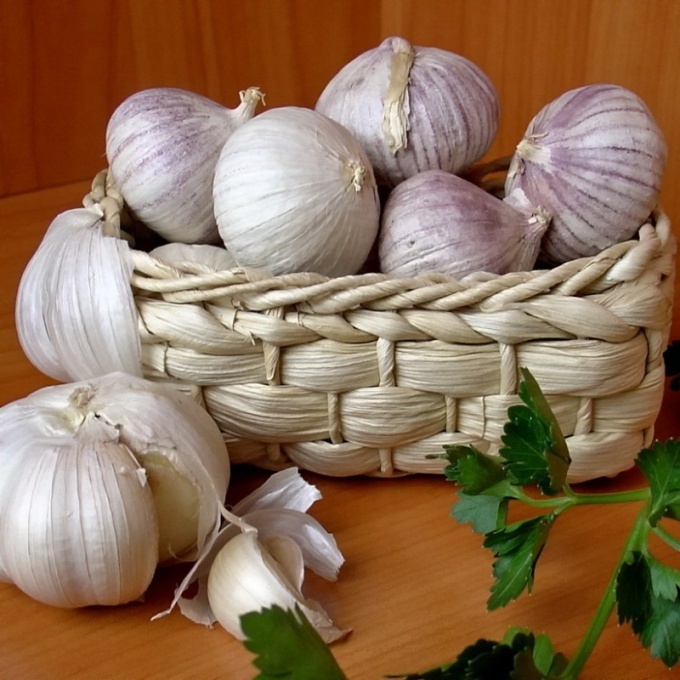 In addition, garlic is very useful, because this vegetable has antifungal and antimicrobial properties. 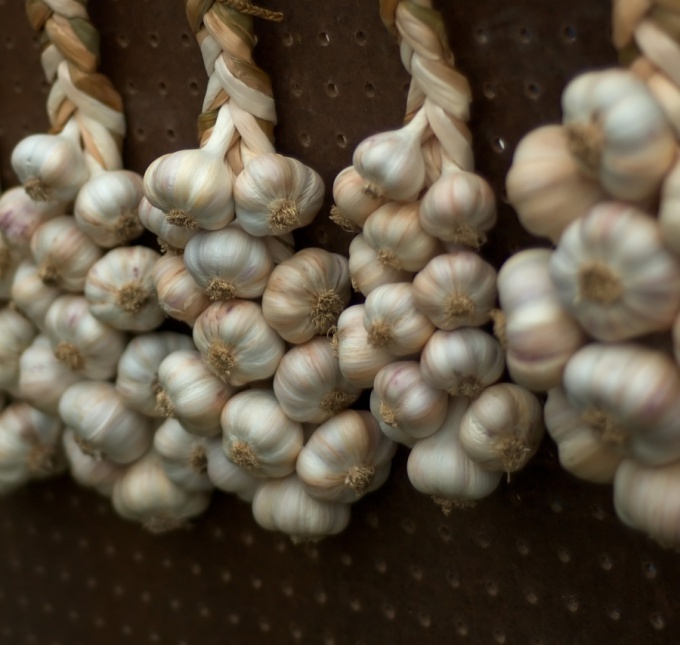 It is a pity that in the conditions of the apartment, not having at hand, for example, cellars, it is almost impossible to keep garlic for a long time. The solution is simple - you need to pickle. Salting the garlic can be different, there are several ways, each of which deserves your attention. Surprisingly, salting allows the garlic to not only deteriorate, but also to preserve all its beneficial properties for eight months. It may not please those who are watching their health and immune status, as well as those who are not indifferent to the sharp, mouth-watering dishes with garlic. - 1 kg of garlic bulbs. If you decide to use this method, keep in mind that garlic, when it is not clean. All you need to do is just to remove all the excess roots and any damaged scales with a knife. 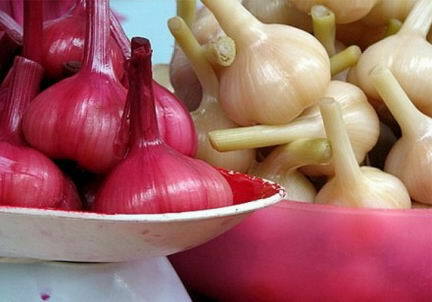 Prepare in advance a suitable size jar, its volume will depend on the amount of garlic that you would like to cook. On the bottom of your container you want to pour a small layer of salt, and over it arrange the heads of garlic. Now you will need to fill with salt between lined with heads, and then make the next layer. The end result is that all the garlic heads are completely in the salt, while the last layer of garlic should be completely covered. When you're done, just close the jar tight lid. Garlic, salted heads need to be stored in some cool place. When you use it in food, almost will not feel the difference between salt and fresh garlic, because it will remain firm and crunchy. - 30 grams of salt. To use this method of brining, you need to clean the garlic, that is, to disassemble it into individual cloves. Peeled cloves of garlic should be cut into slices. To the resulting plastics add salt and mix thoroughly, the grains should be more evenly distributed on the garlic so that lumps don't form. The whole of the resulting mixture should be spread out on the jars the right size, so that capacity was filled as tightly as possible. After this will only seal the jars and send for storage in the refrigerator. This method is suitable not only for pickles Mature garlic, the same way you will be able to save and young garlic, and even his feathers. Just cut all the pieces and salt the same. This seasoning can be added directly to food, in this case, note that in addition to salting a dish is not required. Pickled garlic slices are very good in salads and for making soups and other dishes. - 100 grams salt per 1 liter of water. You do not need to take the garlic apart into cloves, leave the head intact. However, before salting remove all the roots, damaged scales and leaves, and then rinse the garlic under running water, making sure the heads not left the ground and dust. Then put the garlic in a large, preferably three-liter jar and fill with cold water. The next three days you must routinely change the water in banks, about twice a day. After that, the water from the tanks to drain. Now that all the preparations are finished and can proceed directly to the pickling of garlic. A jar of garlic, filled with brine, should be sterilized, bringing it to a boil in a pot of water. Prepare a brine of water and salt, bring the liquid to a boil and let it cool down, then pour the garlic brine. Now you just have to roll up your jars with special lids and send them in storage. Green hot hands and white cloves of garlic contain an abundance of vitamins and minerals necessary for our body. Long the beneficial properties of garlic have been appreciated by the people. But this vegetable is respected not only in the villages. The Queen herself, Catherine the Great made a Declaration of love for simple folk treat. Fresh garlic and adored at the French court. Age of young green garlic short-lived: soon after the appearance of the head covered with skin, and the green loses its tenderness. You need time to have time to pickle this delicacy. In people, garlic is considered a panacea for seven diseases. Each garlic clove is surrounded by the shell. According to the legend, the number is seven. Garlic shells used by cooks. Pre-cut strips when added to a salad give the dish a subtle garlic flavor. Peeled garlic cloves can be stored fresh up to three days. For long term storage you need to add salt to the garlic and spices. In this form it is served with meat, fish or vegetable stew. Garlic decorate the pizza, use the filling for pies, added to baked potatoes or rice. Rinse the peppers. Several garlic cloves collect the largest. Without removing the skins, put them in a pan, add salt, chili peppers, Bay leaf, cloves, peppercorns and rosemary. Add to the pan with the garlic oil mixture so that it is slightly covered the content. You need to cook in a low flame. Stirring with a spoon, be careful the oil is not boiled. After 15 minutes garlic the blank is finished. Cool it and place it in the jar. Store the jar in the refrigerator. Use the garlic as needed. The remaining flavoured oil can be used in the preparation of other dishes. Cut garlic arrows are stored in a few hours they turn yellow, lose their flavor and resounding crunch. The best way to save the shoots – they are salting. Finely chop the greens. Toss them with coarse salt (ratio 1:1), decompose the obtained green mass in sterile banks. The aroma of spices will be an excellent flavor addition to various soups or sauces. Pickled garlic is a condiment that has a pleasant spicy taste and goes well with many foods. To pickle the garlic in various ways, suitable for this purpose and head, and greens. - 200 g coarse salt. Wash your hands of the garlic under running water and finely chop or grind using a blender. Connect the minced garlic with salt, mix well and lay on clean small banks, top lightly sprinkle with salt. Close the jars and refrigerate, the seasoning will be ready in a week. Wash and dry hands garlic, place them in one-liter glass jars, adding to each a few pieces of horseradish, peppercorns, dill and a few leaves of currant. Prepare the brine for this purpose, 1 l of water take 2 tablespoons of coarse salt and boil. The boiling solution, pour in the banks, lay on top of a small load and put pickles in a cool place. In the first days on the surface of the garlic will be formed foam, remove it with boiling water and objavite oppression. When the fermentation process ends, add the brine in the jars, close them with lids and store in the refrigerator. - 100 ml of vinegar 9%. Dissolve in water salt and sugar, bring the solution to boiling and add the vinegar. Pour this brine, coarsely chopped, placed in sterilized jars, herbs and garlic. Banks roll up your tin lids and leave to cool, wrapped in warm towels, then store in the refrigerator. With heads of garlic remove the husk, wash them and dip for a few minutes in boiling salted water. Then remove the garlic with a slotted spoon and leave to cool, then place them in sterile banks. Combine water with salt, sugar and spices, boil and pour in the vinegar brine. When the filling has cooled to room temperature, pour over the garlic and twist the jars.